Equipment: satellite TV; CD player; washing machine, dryer; electric heating. Furnishing: bright, with much wood, well-kept. Please note: Non-smoking house. detached house, 8 - 10 people, 6 room/s, 5 bedroom/s, 1 bathroom/s, approx. 120 m², 2 floor/s. Bedroom 2: (ground floor): bunk bed (0.75 m wide, 2.00 m long), bed for 3 persons. Bedroom 3: (floor 1): double bed (1.50 m wide, 2.00 m long). Bedroom 4: (floor 1): double bed (1.20 m wide, 2.00 m long). Important information: maximum occupancy: 8 adults and 2 child(ren). Kitchen: Kitchen/ cooking equipment: 4 electric plates, oven, microwave oven, dish-washer, refrigerator, coffee machine, freezer. in the living room (ground floor). Living room: (ground floor): furniture suite, fireplace (open), exit to terrace. From the living room stairs to upper levels. Living room/bed room 2: (floor 1, roof pitch): furniture suite, 2 x single bed (1.20 m wide, 2.00 m long) in the sleeping niche, exit to balcony. Sanitary 1: (ground floor): shower, WC, whirlpool. Bathing jetty/bathing: bathing place (shared use) in approx. 2 km (gently sloping). Information on the boat(s): Canoe (payment, request on-site). Rowing boat (payment, request on-site). Infrastructure: reception (available during the whole season); internet access Wi-Fi (included) in the reception area. 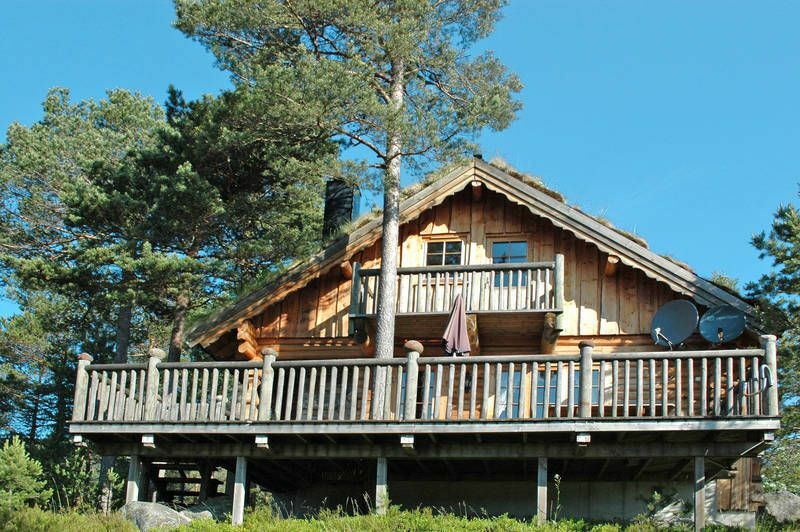 Situation: holiday village Eikerapen, altitude 450 m, lake-view, view of Lake Øre. Sports facilities/ leisure time: shared use (payment): crazy golf, children's playground (limited service in the off-season). Arrival: Airport Kristiansand Kjevik in approx. 87 km. Ferry port Kristiansand in approx. 83 km. Beach/waters: Lake in approx. 400 m (Øre). River (without crossing the street) in approx. 10 m.
Next village/town: Center Kyrkjebygd in approx. 12 km. Kristiansand in approx. 83 km. Mandal in approx. 78 km. Shopping: Next shopping possibility (Kyrkjebygd) in approx. 12 km.